Following his single term as President of the United States (1825–1829), John Quincy Adams, embittered by his loss to Andrew Jackson, boycotted his successor's inauguration, just as his father John Adams had done (the only two presidents ever to do so). Rather than retire, the sixty-two-year-old former president, U.S. senator, secretary of state, and Harvard professor was elected by his Massachusetts friends and neighbors to the House of Representatives to throw off the "incubus of Jacksonianism." It was the opening chapter in what was arguably the most remarkable post-presidency in American history. In this engaging biography, historian Joseph Wheelan describes Adams's battles against the House Gag Rule that banished abolition petitions; the removal of Eastern Indian tribes; and the annexation of slave-holding Texas, while recounting his efforts to establish the Smithsonian Institution. As a "man of the whole country," Adams was not bound by political party, yet was reelected to the House eight times before collapsing at his "post of duty" on February 21, 1848, and then dying in the House Speaker's office. His funeral evoked the greatest public outpouring since Benjamin Franklin's death. 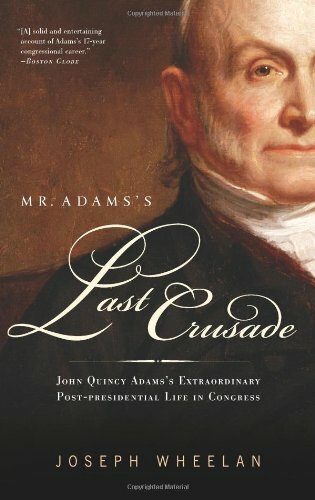 Mr. Adams's Last Crusade will enlighten and delight anyone interested in American history. Joseph Wheelan, a former Associated Press reporter and editor, is the author of Invading Mexico: America's Continental Dream and the Mexican War, 1846–1848, Jefferson's War: America's First War on Terror, 1801- 1805, and Jefferson's Vendetta: The Pursuit of Aaron Burr and the Judiciary. He lives in Cary, North Carolina.